FREE printable low-carb FAQ and diet sheets. All your questions answered. Download below FREE and print to read or share with others. 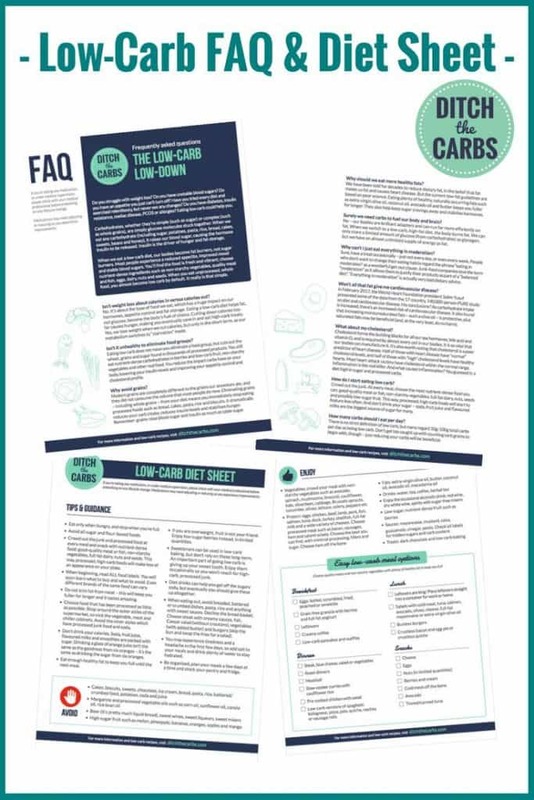 Take a look at my other pages which may answer many low-carb FAQ. I try to give brief summaries, as I am predominantly a Low-Carb Recipe Website, I am not writing an academic thesis here, there are people far more qualified than I am for the deeper questions. As much as I love reading all manner of material, a lot don’t. Many just want quick answers, and I hope I have answered many of them. Please ask further questions in the comments section below, and I will endeavour to answer them. Why Wheat, Grain and Sugar Free? The best way to stay in touch is to subscribe to my FREE newsletter service. It includes regular helpful, educational and entertaining posts, tips, guides, occasional promotions/products/special offers and of course recipes (including exclusive recipes not found on the website). 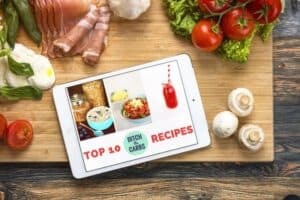 When you subscribe, I give you instant access to my FREE eBook with my top 10 low carb recipes. My newsletter service, helps you keep on track for the long term, but you may unsubscribe at any time. There is an unsubscribe link at the bottom on every email that I send. I don’t want to be cluttering up your inbox with unwanted emails. Isn’t eliminating entire food groups unhealthy? Vegans and vegetarians eliminate entire food groups, but going low carb we only eliminate wheat, grains and sugar, which are not food groups, but sadly found in thousands of products. We still eat good quality, nutrient dense carbohydrates, but in very limited quantities by eating low carb fruit such as berries, non starchy vegetables, and all other real food. By choosing to go low carb, we reduce the impact carbohydrates have on our body, reduce our insulin levels, improve our appetite control, and improve our cholesterol profile. Why are whole grains so unhealthy? Diets full of whole grains, are also high in carbs, cause inflammation, contain gluten that inflames the lining of the gut, which causes leaky gut and malabsorption of vitamins and nutrients. By giving up grains, bread, pasta, etc, you eat far more real food and gain so many more nutrients lost by avoiding a slice or 2 of wholegrain bread or pasta. The use of whole grains in manufacturing, is also a marketing tool to make a product appear to be more healthy and natural than it is. Surely we need carbs to fuel our body and our brain? No, our bodies are brilliant adapters and can run far more efficiently on fat! When we switch to low carb and high fat, the body burns fat and produces ketones. We can only store a limited amount of glucose as glycogen, but we have almost an unlimited supply of energy as fat. The body can also produce it’s own supply of glucose from proteins via a process called gluconeogenesis. How else can ketogenic diets help? By switching your body to run on fat and produce ketones, has been frequently been used for weight loss, athletes for endurance events, help children control seizures, improve brain clarity, reduce risk of alzheimers, and has been shown to aid cancer recovery as cancer cells have insulin receptors and can only be fuelled by glucose. Read the fabulous book Keto Clarity by Jimmy Moore who makes this complicated subject easy to understand. Isn’t weight loss just calories in vs. calories out? No. It is the type of food we eat, which has a far greater impact on our hormones, appetite control and fat storage. Eating high carb, stops weight loss and causes weight gain. Eating low carb stops fat storage and increases our fat burning as the fuel of choice. When we cut calories too far, the first thing we experience is HUNGER. No body wants to fell hungry for a few hours, days or weeks, so we eventually cave in and eat high carb treats. So yes we lose weight when we cut calories, but only in the short term as our metabolism adapts to ‘starvation’ mode and eventually we give in which is why so many people gain the weight they lost (and sometimes more). The overwhelming argument for going Low Carb, is because it WORKS. It is not new, it has been around for a very long time, ask your parents and their parents how they lost weight, they will generally tell you they cut back on bread and potatoes. Low Carb regulates your hunger and satiety hormones. It regulates your insulin. It improves your nutrition, cholesterol profile, memory, and reduces risk of so many metabolic diseases. Won’t I be deficient in some kind of nutrient by not eating carbs? There are zero nutrients in sugar, there are no nutrients in whole grains that can’t be found in meat and vegetables. Eating more GOOD fats such as butter, avocados, meat, coconut oil and cheese, we obtain all our fat soluble vitamins A, D E and K which have been lacking in those following a low fat diet. Eat real food, with real nutrients rather than processed foods which have to be fortified with artificial vitamins, is the approach we should all be taking. Focus on nutrient intake, not calorie intake. We have never eaten so well since going LCHF, we don’t eat any processed food, our intake of vegetables and meat has increased and best of all, our children are growing up knowing what nutrition is, rather than calories. Having a huge salad for lunch is so much better than the handful of lettuce inside a sandwich. Eating just the stir fry meat and vegetables with no rice, is so much better than rice with a little stir fry on top. I would say we have doubled our nutrient intake since going LCHF. Can I eat carbs again once I lose the weight? You may be able to increase your unprocessed carbs slightly, but why would you want to? Low carb, high fat is actually a healthier way to eat, it controls your appetite, lowers inflammation, better regulates your cholesterol profile, supports healthy hormones, and reduces your risk of all metabolic disease such as diabetes, heart disease, alzheimers, stroke, cancer …..
Don’t worry, you don’t have to give up alcohol, but choose wisely and don’t overdo it. Avoid beer, especially the craft beers and those that are dark, red or malt. Also avoid any alcoholic drinks which are high in sugar such as white wines, dessert wines, sweet wines, schnapps or spirits with sweet mixers such as sodas, juice or syrups. Go for red wines, spirits mixed with diet soda, water or on the rocks. The other point to remember with alcohol is that it is the first fuel to be used over anything else so weight loss may stall, it also gives you the ‘munchies’ and you lose your willpower to resist those high carb snacks late at night. So go ahead and enjoy a glass or two, but really savour them and enjoy them, and don’t overindulge. Why can’t I just eat everything in moderation? Sure have a treat occasionally, but personally, why would you want your health in moderation? The M word (moderation) is used so much to justify having a little bit of everything is OK. It is also the excuse many give for having a defeatist attitude like “well, there’s no hope for me then”, “there’s no way I can give up bread, pasta, rice….”. Why would you want to eat foods that we know are harmful, cause inflammation and increase our risk of so many avoidable diseases. And how is moderation going for the general public? Hmmm, not that well if you look at the health of most countries and the size of people on the street. If moderation is an occasional treat, great, but for most, treats are almost a daily if not 2-3 times daily occurrence. Children now, by the time they are 8 years old, have eaten as much sugar as an adult did in their entire lifetime a century ago. Modern foods are so far removed from what our grandparents ate, and in no way are they only eaten in moderation. Moderation used to be a treat once a week or on birthdays, having treats that rarely, is seen as restrictive when really it should be the norm. So do I have to eat a tonne of meat and protein? No. Eat moderate amounts of protein, usually between 1-1.5g/kg is recommended. Excessive protein will raise your glucose levels through gluconeogenesis. Can I drink diet drinks? Can I eat lots of low carb desserts? What we are trying to do is get rid of our sugar cravings and any cravings for sweet things. I believe there is a place for diet drinks initially to help you overcome the sugar cravings, but eventually, you want to give them up because they are so processed and there is debate on whether they affect our insulin because they still have an effect on our sweet tastebuds. As for low carb baking, I do include low carb dessert recipes on Ditch The Carbs for times that we want to indulge, but really I see it as part of the low carb ethos that we actually want to get away from sweet treats. Why would we want to find a substitute for what we are trying to give up in the first place. So sure have low carb desserts, cakes and biscuits, but not often. Don’t make them part of your everyday life. But I’m skinny, why do I need to eat low carb? People can be skinny or overweight, but still undernourished. Processed carbs are unnecessary and offer no nutrition. By going low carb, increasing meat, vegetables and good fats, our nutrition improves, inflammation decreases, insulin is stabilised and reduce our risk of heart disease, alzheimers, and all other metabolic diseases. Remember it is our HEALTH that is important, not our SIZE. Skinny people can have high visceral fat (the dangerous fat which surrounds your organs) but not tummy fat, and obese can have little visceral fat but lots of tummy fat. How many eggs can I eat? Go for it!!! Eggs have been off the menu for so long because of the fear of cholesterol, but after it has been found that there is no link between saturated fats and heart disease, the restriction has been lifted. Eggs are the most perfect food and little powerhouses of nutrition. They are often referred to as natures multivitamin. They improve you cholesterol profile, contain choline which is necessary for brain health, contain all the amino acids we require and are a versatile ingredient for breakfast, lunch, dinner, snacks or baking. Just keep an eye on how much protein you are having. I eat 2-3 eggs every morning for breakfast. How low carb should my children go? Great question. My children eat exactly the same meals as I do, which is quite low carb, but they do eat more fruit than I do. They snack more than I do, and I rather they snack on good fats such as cheese, avocado, olives, eggs and cold meat or low carb fruit. Children are more carb sensitive, and so have less of an insulin response to carbs. I allow them to have cake and treats when out with friends, or at parties as I think it is so important for them not to feel different. They also don’t want to be seen as the fussy child who never gets invited anywhere. And as the publics perception of sugars and grains is changing, I hope these high carb parties will become less. But it is not a big part of our diet, so I don’t worry. Our diet at home is quite low carb, but with occasional treats. I just make sure that the treats are in the form of unprocessed, good quality carbs. My children have developed the taste for 90% cacao chocolate that not many adults like. I want to set them up knowing nutrition is number one priority, because without our health, we can’t do the things we want to do. They have a healthy respect for food, they love making up recipes in the kitchen, and love finding the hidden ingredient in my meals. They have the taste buds many adults would be proud of, but at the same time they are healthy young children who are not overweight and who enjoy a treat. Do not keep processed rubbish “food” in the house, and they will not be tempted. I have written an entire page regarding cholesterol, but the main take home message is that cholesterol is required by almost every cell of the body, if we don’t have enough, our body will manufacture cholesterol, it is that vital. Cholesterol itself is not the problem, it is how it is transported within the body that is the problem. By eating a high processed high-carb diet, our body carries cholesterol in angry little LDL particles which are the dangerous ones that begin the process of inflammation and damage to our blood vessels. Cholesterol is a poor predictor of heart disease. Half of those who have heart disease have normal cholesterol, and half of those with high cholesterol have healthy hearts. Inflammation, triglycerides, insulin resistance and LDL particle size are more reliable markers of heart health. Low cholesterol is actually associated with many other symptoms such as memory loss, Alzheimer’s, low Vit D, and depression. Read The Great Cholesterol Myth and Cholesterol Clarity, to really understand this complex subject. Can I eat low fat foods and lose weight faster? No. Firstly, most ‘low fat foods’ are actually high in carbs. When the fat is removed, it is generally replaced with some form of carbohydrate, and is usually highly processed. Secondly, cutting down on carbs and fat is unsustainable. You need fat to make you feel fuller for longer. You need fat for your fat soluble vitamins A, D, E and K. If you remove carbs and fat from your diet, you are left with protein. Going too high in protein will raise your glucose levels through gluconeogenesis. Check the labels to check the fat and carb content, for example low fat cream cheese can have 15% carbs, whereas the regular cream cheese has 4%. Why can’t I eat cereals? Even the organic, wholegrain ones? Read my post on cereals. If you understand what is wrong with cereals, you will understand what is wrong with modern food production. To put it bluntly, cereals are cheap grains which are highly processed, stripped of nutrients, then fortified with vitamins. They are incredibly high in carbs, colours and sugars. And don’t be fooled by marketing that organic is best (there is no such thing as a healthy sugar), we need whole grains (they only increase your appetite, spike insulin and cause a leaky gut and malabsorption of nutrients) or the if they have the Heart Foundation Tick they must be good for us (manufacturers reformulate their products to get the ‘tick’ as they know this improves sales). And definitely don’t go for cereals with dried fruit (natures candy), or add fruit yogurt (packed with sugars), or add tinned fruit to your cereal (again, full or sugars even if they are in natural juice or syrups). There are so many better alternatives which are full of nutrition. Go for eggs, bacon, mushrooms, vegetables, Grain Free Granola, smoothies with spinach, last nights leftovers. Is there a healthy sugar? Can’t I use honey, agave, maple syrup or dried fruit? No. 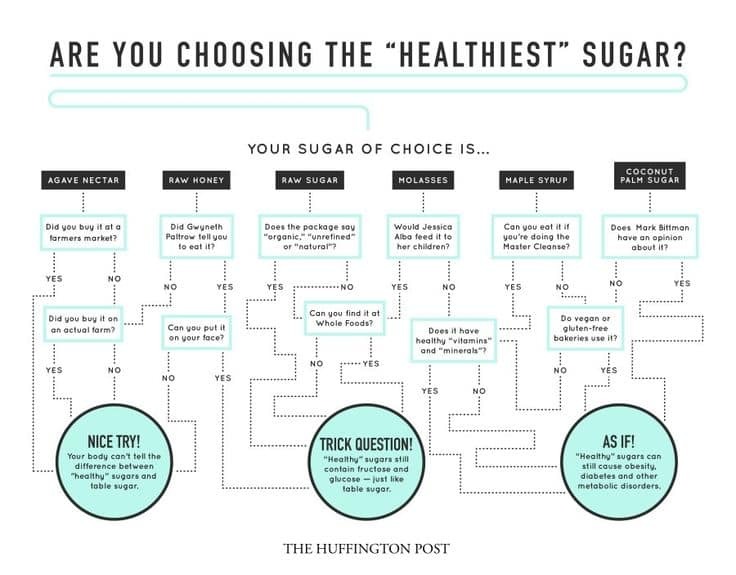 There is no such thing as a healthy sugar. Yes these may be ‘natural’ but the body sees them all in exactly the same way – sugar. It is marketing that has made us feel better about sweetening foods with natural ingredients such as honey, maple syrup or dried fruits. And no, getting these sugars from a farmers market isn’t any better. Trade Aid sugars aren’t any less sugar too. And as for Agave, it is 80-95% fructose, which is just a natural form of HFCS (high fructose corn syrup). Fructose is not metabolised in the same way glucose is, causing visceral fat (dangerous fat surrounding our organs). Read my Ultimate Guide To Low-carb Sweeteners. Can’t I just go gluten free? There is a subtle but very important point here to remember. Gluten free (GF) is not grain free and is not low carb. GF products contain rice flour, potato starch, tapioca starch, cornflour and other high carb substitutes. Gluten free products are so highly processed and so expensive. A multi billion dollar industry has evolved around going gluten free. GF products are so expensive, high in carbs, fortified, and unnecessary. By going grain free, you avoid all possible sources of gluten. It is a more nutritious way to eat, eating whole foods, real foods and cheaper. Don’t be fooled by GF marketing. They are encouraging the GF message, by encouraging you to buy their expensive products. Read this post why gluten free junk is still junk. You could use this cupcake recipe that only requires coconut flour. Simply omit the berries and add extra lemon zest. I am developing more and more coconut flour recipes because of the numerous allergies to almond flour and the omega 3:6 ratio that isn’t so great in almond flour baking when eaten in large quantities. You can see all my coconut flour recipes that only use coconut flour (or have a recipe note to show you how to adapt it to become coconut flour only). See the recipes here. So what is real deal on resistant starch? Hi Im new to Keto and want to try it out, I also can’t have to much dairy, is there an alternative? I do how ever love cheese. I’m a bit confused, are you dairy free? If you love cheese which dairy in particular do you need help replacing? Hi Dani – you can use coconut milk & cream as dairy milk alternatives likewise coconut yoghurt instead of traditional greek yoghurt. In cooking (such as low carb baked goods), almond milk can be used instead of dairy milk. Likewise you can use almond milk in hot beverages. If lactose is the basis of your dairy avoidance, you may still able to tolerate butter and some hard cheeses. What is your stance on LCHF and breastfeeding? Also my 3month old has had thrush before and I was told that thrush thrives on ketones.. so I’m hesitant to go back to LCHF until after nursing. I enjoyed the lifestyle before pregnancy and am wanting to go back ASAP but not at the risk of my milk supply. There are many mums in my Low Carb Support Group who are successfully LCHF and breastfeeding. Head over and ask them some questions. Hi, I just ran across this information about freezing egg yolks and egg whites for use in the future. Since many LCHF recipes call for one or the other, I thought this might be helpful. Brillaint! Thank you, this will be super useful. Libby, where do you stand on lard? I’m guessing it’s okay to use because it is low in polyunsaturated fats but high in saturated and monounsaturated fats. Any reason I should stay away from using lard for frying? Lard is superb. It is a very stable fat and like you say, a great source of saturated and monounsaturated fats. Go for it. I made the crackers with the exact ingredients in the recipe. The dough was way to soft. I made them and after removing the top sheet I tried to score for future breaking apart. When they baked it al ran together. Looked a mess but tasted good. I was using almond flour 1 3/4 cup……any idea as to why my dough was so soft? Which recipe are you referring to? Hi, I am very new to this and your website was recommended by a friend. I think your website is fantastic and I can’t wait to get started transforming my diet to lchf. I see a lot of recipes include cheese (which I absolutely love!) however I am breastfeeding my dairy intolerant 7 month old son and can therefore not eat cheese. I also don’t eat eggs so these factors seem to cut out a lot of recipes. I really want to change my diet however I am worried I won’t have enough alternatives and resort back to eating lots of bread! I would greatly appreciate any advice 😊. Gosh, avoiding cheese AND eggs is a tough one. It may be a little trickier but I am sure you can do it. Many readers tell me they can buy non-dairy cheese in their countries, could that be an option for you? I’m hoping you are able to tolerate nuts, berries, fish, meat, vegetables, coconut oil/cream/chips/butter, etc. How about butter or ghee? Even those with dairy intolerance have found they can tolerate those as they are predominantly lactose free (check each brand however for accuracy). What about coconut yoghurt? As long as you are eating non-processed food, lower in carbs, you will still have success without going back to bread. You may have to have a fewer higher carb nutrient dense foods, but still be able to avoid sugars and grains. Good luck, and let me know how you get on. Hi Libby, Will I come to much harm by using Xylitol 1/4 metric tsp in my bed time cocoa (made with Dutch Cocoa powder, boiing water and pouring cream? I hate the aftertaste of stevia, have tried to give up all sugar, went from 2 tsps to 1/2 tsp to none over several months but stopped drinking because I hate the unsweetened taste. Now having 2 cups of coffee a day, cream but no sugar, but bed time I really miss my cocoa. Old chook, lots to loose, and I cannot use too much Xylitol anyway because of GI disturbances. Have started drinking Bonox with 10G butter once a day as I get bored with plain water. Hi Rieann, I’m sure the tiny 1/4 tsp xylitol is fine to continue with (keep it away from dogs as it is toxic to them). You have managed to cut back so much already, well done. I am sure in time, even this bedtime taste will subside also. I am starting to add a good pinch of cinnamon to my creamy coffee, what a difference in flavour that makes. A little bit sweet and so much punch. You might like that also. Hi Hazel, I have just written a post and complied vegetarian recipe for readers like you who are finding it hard to go LCHF as a vegetarian. Great stuff that you can eat eggs, that will help with your protein. Do you like cheese? That would really help too. I hope you can find some ideas in there, and these are my veggie archives. Hi Libby, thanks I will certainly try these recipes. If I was unable to sustain LCHF 7 days a week would I still see results on say a 5 :2 regime? Are outtakes and cannellini beans allowed? . I’m sure fasting would help. Beans and pulses generally are avoided but vegetarians quite often keep them in their diet and are still successful. The ethos of LCHF is to base our meals on real whole foods that happen to be lower in carbs and higher in healthy fats. I wouldn’t get too bogged down with numbers and counting. By removing sugar, processed foods, and meal bulking agents such as bread, pasta, rice etc, you’re become low carb almost by default, so you’re virtually there. Hi Libby so many vegaterians even vegans gain weight and it’s due to the even higher carb intake eaten to replace eating animal products. try drop the carbs and increase vegetables full cream dairy and nuts and seeds instead. Yes that is preferable, I never seem to find the time. How I see it, is for most people the majority of our salt intake used to be from processed foods, snacks, crips, chips, cereal, bread etc so I actually add salt to our dinners now. As much as many of my recipes use bacon and ham, I don’t go overboard on them. I probably buy one packet of bacon per week for a family of five, and ham off the bone each fortnight. Sausages I choose the ones with >80% meat and minimal processing. There is research to show that it is actually sugar that is more dangerous to our blood pressure than salt. This is a great summary in the BMJ. I love the fact you’re a cardiac nurse here. I am a pharmacist and I can’t believe how many health professionals I am meeting are doing their own research into the role nutrition, carbs, fats etc are having on our health and medication needs. I truly think medicine will be a totally different picture in 20 years time, I’m not waiting and it seems there are thousands who think the same. I was just wondering where you learned all about LCHF? Your recipes look very yummy! Mainly through workshops held with Prof Grant Schofield, Dr Caryn Zinn, and I occasionally write for Diet Doctor also. I am a registered pharmacist so do much of my research through trusted experts who I have become friends with via my work here. I try to leave the technical research to them, I can’t write academic posts here, that is their incredible domain. I just try to write simple articles and at the end of the day, families just want to know what to eat, that’s where I am hoping I am having a genuine impact. I’m so glad you’re enjoying them, Libby. Afternoon Libby Which Bacon and Ham are the best to eat with the least amount of nitrate. I buy Henderson’s bacon which is incredible. I have been on the LCHF diet for 9 months. For the first 5 months I did really well. I lost 20 lbs. and felt great. I never cheated. Then I noticed my hair started falling out and I had a bad headache every day and started gaining weight. I did a urine pH test and I am at 5. I don’t know what is causing this. I can’t afford to lose any more hair and I am very discouraged. Any ideas? I am still in ketosis. Also, my blood pressure went way up and my bones and muscles ache. I can’t give medical advice and don’t know all your medical background, so it would be prudent to see your GP to get some blood tests done to see what else is going on. Checking your food diary would be helpful for them to see your average daily intake. In January 2016 my husband’s doctor told him he was pre-diabetic because he had an elevated Hemoglobin A1-C. Instead of even mentioning dietary changes, she suggested he go on Metformin. We both had cholesterol levels in the 230s, triglycerides in the 160s, LDLs above 150 and HDLs around 40. Neither one of us were overweight, but not underweight either. Not wanting him to go on medication, we ditched that doctor and Ditch the Carbs became our new mantra. We didn’t do anything radical. Just decided most processed foods were the enemy and simple eating meant healthy. We used a carb guide the first two weeks just to get an idea of the numbers, and our goal was to eat no more than 25-30 carbs per meal. We stopped bread, rice, potatoes and sugar and increased healthy fats. We eat walnuts and almonds daily, an avocado daily, a lot of cruciferous and dark leafy veggies, berries, protein, cheeses, eggs, low carb granola, low carb flat bread, low carb tortillas and almond milk. When we want something sweet we eat a chunk of dark chocolate or yummy low carb peanut butter cookies. Occasionally I try a new low carb dinner recipe or dessert just to keep things interesting, but 9 months in we eat as much as we want when we want and feel satisfied and healthy. In July we both had our annual blood work done and the change in numbers was nothing short of amazing. And my husband’s were equally impressive, although his HDL was in the 80s. Great!! His Hgb A1-C also dropped a few tenths, but we’re hoping to see even more improvement with time. There was no magic bullet here. We used Ditch the Carbs to get us started and now our habits have become our lifestyle. As time goes on I hope to broaden our horizons in low carb cuisine, but what we’re doing now works and we are jazzed. Thank you, Libby! fat is between 115- 130gr so I will lower this. Do you feel this plan is good or should I adjust it even more. Thank you for any help you have to offer. Hi Martha, I cannot give individual medical advice but all the experts are telling us that triglycerides are the best indicator of heart health and carbohydrate control. This page explains cholesterol carriers HDL and LDL. High cholesterol is seen to be an indicator of health and longevity and low cholesterol is linked with dementia, depression and shorter life span. Take a look at this great article by Dr Aseem Malhotra regarding cholesterol. He’s a wonderful cardiologist who is challenging what we currently think about cholesterol and it’s role in cardiovascular disease. Thank you for the article, it gave me some peace about the increase of cholesterol. I am wondering though if the increase is a sign that I am not in ketosis? I haven,t really lost much weight either! I make sour dough bread using a yeast free starter, it’s a 3 day process and the ‘grains’ are soaked over night – including sesame seeds, chia seeds, sunflower seeds, pumpkin seeds, also kibble wheat grains, jumbo oats, whole barley grains, so even if I replace the last 3 grains with seeds and because it still has wholemeal flour, I’m guessing it is still high carb? I LOVE your blog, Facebook posts and Pinterest boards. You’re a treasure trove of good information. I’ve been on a strict lchf diet for about a month now. Feel great and I’m losing lots of inches. My question that I can’t find an answer to despite all my searching is this: I am not hungry…ever. I usually have to force myself to eat a meal. I drink coffee with tons of fat in the morning and then I’m good until dinner. I’ve been tracking my meals on a app and am averaging about 900-1100 calories per day. I have plenty of padding to lose, so is it necessary to eat? Can I just trust my body and eat when I’m hungry? Should I force myself to eat more calories? Help…..
Take a look at Diet Dr who has some fantastic posts on intermittent fasting. There are many kinds of IF so read this FAQ on the subject from Dr Jason Fung who is an expert in IF. Learn to trust your hunger, if you are not hungry do you really need to eat? If you still have weight to lose then let your body burn your body fat rather than fat from a meal. You need to eat to obtain vitamins, minerals, nutrients etc so make any meals you do eat as nutrient dense as possible. Never force yourself to eat. Trust your appetite, learn to understand it and eat only when hungry. The 3 meals a day and constant snacking is such an urban myth led by food companies. I’ve just started the LCHF diet but am finding it very difficult. Everytime I find a recipe that looks good, it either has NUTS or EGGS, both which I am allergic to. So breakfast, its been either Bacon tomato and onion or Yogurt with Berries and Sunflower seeds. The bacon is good and keeps me full but I can’t eat it every day and Nitrate free bacon is expensive. Lunch I made some beef cheese patties, with cheese,lettuce and tomato. Sometimes just a salad with lots of cheese. Dinner is a bit easier, Chill con carne, Roast chook with sweet potatoe and beans and others. So Breakfast and lunch are a problem for me. I’d love it if there was more I could eat. I am trying to develop more nut free recipe and now egg free as so many are reporting egg allergies. How about Caesar salad (without the egg mayo), grain free granola, bunless burgers, lettuce burritos etc. Its my 3rd week on cutting out carbs and I am now starting to find it really hard to enjoy the food. I miss my carbs. I’m thinking i might just try and reduce the amount of carbs I eat. I hope that can make a difference. If you are struggling, even cutting back on the carbs will help. Personally, I went LCHF slowly. I started to reduce my carbs from bread, cakes, pasta etc, then as I got used to that, I slowly became stricter as I didn’t fancy those high carb foods anymore. As I reduced my carbs, I felt happy to increase my healthy fats. Be guided by how you feel and go at your own pace. You don’t have to go keto and it doesn’t have to happen overnight, in fact I think if you gradually go low carb, it is easier and more sustainable. Eventually I will add a small salad in place of the rice. Dinner is shake with 1/2 very small banana, protein powder and collagen powder as well. I also add 1/2 Tbsp. either coconut oil or extra virgin olive oil. I also have 8 oz. bone broth. Total carbs for the day is 60. So—-slow weaning is going to be the way I will do this. I’m really looking forward to it! Linda you are doing so well. I truly believe slow and steady wins the race. Come and join my new Low Carb Support Group, you can ask all things low carb. See you there. Hi Libby, I just found your site today and am so happy I did. We are, somewhat nervously, beginning LCHF with our 12.5 yo son tomorrow. There is not much support online, that I can find, to guide parents through this for their children. My son plays sports all year round but has had several injuries the last 6 months around his growth plates causing a lot of down time when he is usually exercising. He also started middle school and they do not have gym class or recess. He has gained 24 lbs in 10 months. I think he is eating more because he’s bored, or maybe even mildly depressed from all the inactivity and not getting to play on his sports teams. After we noticed some weight gain, about 5-7 pounds, beginning to appear, we drastically changed his diet to very low fat, slightly more fruit, and better lunches and dinners and he has continued to gain weight. I also think during his injuries, we allowed him too much video game time and enabled some of this weight gain. He also started drinking less water and more juice when he wasn’t in his sports. I know he might not enjoy us taking so much control over his “diet” but I also know that it is because I love and care for him that I need to get him in a better way of eating. I also feel I should be a role model while doing so. I have been LCHF off and on for several years and always feel better when eating that way, I do fall off the wagon because I give up and/or don’t give myself enough variety and am the only person in the house eating that way. After several discussions with my husband, we have decided as a family to convert to LCHF and while our long term goals are to achieve healthier bodies, I’d also like for my son to hopefully see some weight loss through the transition. Do you know what the recommended amount of carbs is for a 12.5 year old boy? Perhaps one recommended amount to help him with weight loss and different amount once he’s achieved his weight goal? He is 5 feet 1 inch and weighs 127. He was 4 feet 11 inches and weighed 102 at his physical 10 months ago. Thank you for any help. I feel rather lost and don’t want to do anything to hurt him. Hi Missy, I cannot give advice here but what I will say is what I do with MY children. They are low carb not no carb, my emphasis is on nutrient dense food and no sugars, no grains and no processed seed oils. What I see when parents switch to LCHF is the children’s health improves and weight loss is a direct response to their improved health. They gain increased insulin sensitivity and they are no longer driven by insulin led hunger so their insatiable appetite slowly disappears. I don’t count carbs for my children (nor for myself) I want our way of life to be sustainable for the long term and not to be complicated or difficult. I don’t want my children growing up with any food issues, just junk food issues 😉 I hope this helps, if you need to see a low carb dietician, I can point you in the direction of a couple I trust. You are doing an amazing job taking control of the situation and helping your son to greater health, take care, Libby. I have a question about gummy supplements. First thing in the morning I take gummy supplements, so right from the start I have consumed 31g in carbs. Should I stop taking them or is it okay not to count these carbs? Personally I wouldn’t take supplements which are in effect candy. There are so many good quality supplements these days that do not contain sugar. Speak to your pharmacist to find an equivalent without the sugar. I am so excited and extremely thankful that I found your website. This has exactly been my thoughts for years but everyone says to watch the fats. Your recipes are awesome. I think I have died and gone to heaven! My only question is about meat. Do they need to be organic or grass-fed? Also, I have always heard to stay away from ham and bacon because of the nitrates. Is it OK to buy the meat and bacon at the local grocery store or do I need to go to the city and buy organic or grass-fed? Donna your comment is lovely to receive today, I’m glad you found my website and it is helping (and you are discovering new recipes to try). As for the meat question, yes without a doubt grass fed organic is best but that is simply out of the reach of most people. I am lucky enough to live in NZ where all the meat is pretty much free range and grass fed (other than pork which I have to check first). For those who simply cannot afford to eat organic grass fed, I say to just eat the best that you can afford, and those are generally the people who need help the most. I have readers who haven’t cooked for themselves in 20 years so as long as they are cooking simple meat, vegetables and healthy fats, that is an improvement for them beyond believe. I also don’t advise specifics for meat as it turns so many people away as it is unobtainable for so many families. I want to be realistic and get families away from ultra processed food and back to cooking family meals. As for ham and bacon, that is something I will only buy that is not pre formed (i.e. : off the bone) and with minimal additives. I have found one that is nitrate free and amazing. Again with processed meat, find the best quality, the least human intervention and back to basics. Gosh that was a long winded reply, I hope it answers it all. Fabulous questions to ask. Libby. Hello, Re: Grass Fed Meat. A local butcher (Australia – Regional NSW) told me that if you buy from your local butcher and it’s vacuum packed/Kryvac it’s feedlot, otherwise it’s all grass-fed (i.e. Off the hook). This applies to Beef and Sheep but with pork you have to ask. Hi, what’s your take on food combining? I’ve read that fruit should never be eaten with or after any other macronutrient meal. Is it true that starchy foods should not be eaten with protein and fat. Very interested in your reply…I eat my protein and fat sources with leafy non starchy veg…but will eat fruit as a snack alone and sometimes a starchy homemade soup as a separate meal. I have never investigated food combining so sorry I don’t have an answer for you. I am going to be attempting the London Marathon in April. All of the advice I can find about what to eat in advance talks about ‘Carb loading’. What, in your opinion, is the best LCHF version of Carb loading, or isn’t there one? Take a look at these two books. The first is called “What The Fat – Sports Performance” written by the leading LCHF academics here in NZ, and the other is “The Art And Science OF Low Carb Performance” by Steve Phoney. Both are excellent books which cover the science and practicalities of LCHF athletes. Good luck. It has always been a dream to run the London or NY marathon. Do the nutritional counts in your recipes reflect the actual carbs or net carbs (carbs less fiber)? They are total carbs. To get the net value, deduct the fibre. Should you take any vitamins? You shouldn’t need to if you are eating well balanced meals with plenty of fresh real food, vegetables, good quality protein and healthy fats. Some people however take magnesium for relaxation, sleep and bowel movements, and omega 3 to balance their 3:6 ratio. That’s another whole post in itself. Read this, it may help. First of all: thanks for such a great website! Great Information and insights. I do have a question though. I have been trying to avoid sugars as good as I can, not because I need to lose weight, it just makes me feel better and healthier, and been learning much about it. I noticed that in many of your recipes you use stevia as a sweetener. How come? Aren’t there chemicals added if you use the granulated form? What does or doesn’t it do to your body that other “natural” sweeteners like agave, honey or dried fruits do? Hi Mel, and great question. Yes, I use stevia but the minimum amount required to sweeten a recipe. I also say “or sweetener of choice” if you prefer to use something else. I use stevia as it doesn’t raise your blood glucose at all which honey, fruit or dried fruits do. Agave is mainly fructose so I would avoid that completely. Stevia and sugar are both ‘natural but processed’, so I choose stevia as it keeps sugar, insulin and appetite in control. The choice is ultimately yours, and the ethos of going low carb is to give up the sweet foods but having a low carb alternative on hand is always a good option when needs must. Happy New Year. My husband had a kidney transplant five years ago, but since has had trouble keeping his weight under control so his specialist has recommended an LCHF diet, so I was thrilled to come across your page and all the awesome information & recipes, it has given us a great starting point. I just wondered when looking at food labels do you have a recommended level of carbs per 100gms that we should be looking for?? I am looking forward to our new food lifestyle for both my husband & my children, I can see so many benefits coming from it, thank you. Hi Victoria, I am so glad you have found my website and it is helping you and your husband (and what a sensible specialist you have to recommend LCHF). Many people try and choose foods that have less than 5g sugar per 100g but that doesn’t account for the carbs. I think it is best to look at carbs per serving rather than 100g as this is what you will be consuming. My carbs mainly come from leafy vegetables, berries, nuts and dairy. Once you give up the obvious places sugar and carbs come from such as cakes, biscuits, drinks, sweets and processed food, you almost become low carb by default. The main foods where carbs can sometimes creep back in is by eating excessive nuts and dairy so just keep an eye on your daily amounts. Join me on Facebook too to get support and ideas, and subscribe for free recipes when i post them. Happy new year to you and your family, Libby. Well we are off to a pretty good start, we are loving your no gain cereal, your grain free granola bars and your blueberry cheesecake squares and the weight is coming off, so thanks. I still miss my toast and rice crackers but I’m sure i’ll get over that!!! I note you recommend approx. 35-70 gms of carbs a day but what is the max you would recommend per serve, i really just need a guide for the likes of yogurt & cheeses etc… that i do buy. I don’t really count carbs any more. I always eat low carb nutrient dense foods and eat until full. You are right to be aware of your dairy intake. Yoghurts, milk and cream can soon add up. Luckily cheeses are far lower in carbs. I buy unsweetened natural yoghurt which is apron 3-4% carbs and only have about 100g as a serving size. I also restrict how many milky coffees I have as that used to be my downfall, so I have 1/day or use a smaller amount of cream and have 2. Hope that helps. Hi Cathy, yes seeds and nuts quickly add to our carb intake so be mindful of how may you’re getting through each day. Being a T1, have you joined Type One Grit Facebook page? They are a fabulous group with amazing support for diabetics (all types) following Dr Bernstein’s approach. Also take a look at my Pinterest diabetic boards. Let me know if you would like to join as a contributor. You will learn to trust your satiety and hunger. Eat until full, or eat until almost full as it takes a while for your stomach to register that you may have eaten enough. You will also learn not to overeat and not to overindulge in any one food, which is what so many people have been used to for so long. Once you have been LCHF for a while you really will be in control of your hunger, as you are no longer driven by the sugar/insulin roller coaster. This is why LCHF is so successful and sustainable as this way of eating dresses the main issue – appetite control. Low fat diets just leave you hungry and lacking the healthy fats we so desperately need in our life. Eat until full, variety and balance, eat real food and you will be successful. I went to a allergist and she did the test where she put the name of the product that was in a glass jar up to my check my left arm out straight & pushed down on it if my arm went down then I had an intolerance to this specific food. So wheat dairy sugar soya peanuts funny enough I was,okay for oats. So I went bought expensive wheat free stuff tryd making my own bread with buckwheat flour & grains.I am drinking coconut milk on my oats but having read all your information I’m more confused. I find shopping a nightmare. I noticed you use ham & cream cheese things that are processed & this lady would have told me to stay away from pork & anything proceed which in this day is impossible. Help :-). I’m on fitness pal what should I enter for Carbs/Protein/Fat as a percentage? Generally if you want to lose weight keep your carbs below 50g, lower if you want to get into ketosis, or between 50-100g if no weight to lose and are not a T1 or T2 diabetic etc and have good appetite control and blood glucose control. It all depends on your health issues also (heart disease, blood pressure etc). Take a look at this handy keto calculator which may help you refine your percentages on MyFitnessPal. I set MyFitnessPal at 70-20-10. 70% fat, 20% protein, 10% carbs. Urine ketone strips are a good, cheap way to see if you are in ketosis but they are quite inaccurate. Blood ketone strips are more accurate but incredibly expensive. I have a blood glucose meter. I went through a phase of seeing how much my blood glucose would rise after certain foods such as coffee, protein, fat etc. It is really up to you how much testing you want to do. I don’t think it is really necessary to test, just because I like to keep things as simple as possible. Saying that, others love to test as it really keeps them on track and they learn about how their body handles carbs/protein/fat. Thanks Libby for both replies. But I am gutted about the bread as a small piece seemed to keep me full for a long time without my blood sugars going low. Which are the best high fibre foods (yet low carb) to ensure that I dont get constipated? All manner of non starchy vegetables but especially leafy greens, flax seeds, coconut flour, chia seeds etc. Once we are in ketosis and burning fat for fuel what happens to the fat we eat and don’t use? Is it stored? How? Is it excreted? Excellent question. It is hard to truly overeat fat if we are eating only to fullness and our appetite is regulated. The fat will all be used as fuel as long as your carbs are low enough. There is a good article on overeating fat on Diet Dr. As long as you are maintaining or losing weight, it will appear fat is excreted by being exhaled! Here is a great article explaining that. If you are gaining weight through possibly eating too many carbs, it is being stored as fat. What kind of coconut cream do you use? I just found your website this week. I am trying to cut back on carbs for our family I am getting a lot of resistance. I am making your drumsticks today. Here is a selection of Coconut cream on Amazon. I currently use Kara brand but as long as you find one that is about 25% fat and only 1-3% carbs should be fine. Hi Libby, just wondering how much is too much cream? I don’t have any milk but just love cream in coffee (decaf), with fruit, in omelets and some of your desserts. Is it better to replace dairy cream with coconut milk/cream or just lower the amount altogether? Cream has the less carbs (3%) as milk (4.8%) and you end up using far less cream in a coffee than a milky latte. It is higher in fat which will keep you fuller for longer. Generally people cut down on dairy if their weight loss stalls as the carbs can soon add up so keep going depending on how your weight is going. Hi Libby, this may not be the right place for this question but here goes. Which cream cheese do you recommend? I am after the one that is least processed. Hi Libby, thanks for your reply. I am tracking although it seems even having a green salad has too many carbs. My day consists of 100g lean meat/chicken/fish twice daily, green salad and or broccoli, half cup organic frozen mixed berries. Meat is cooked in a tbsp ghee so cal are way down but cannot reach my fat intake or protein intake so looking at my tracking my carbs seem too high. I have been eating like this since beginning of year and still no results 🙁 I used to be extremely fit and then had a spinal injury which led me to almost wheel chair bound then had an op and I think all of the meds and contributing factors led me to putting on a lot of weight. I would like to lose 40 to 50kgs. On the surface it looks like you should be losing weight, your carbs are low, protein not too high, but like you say, not enough fats. Are you eating/drinking things that you are forgetting to track, for example coffees with large amounts of milk? Be really honest for a couple of days and track every last thing. I use My Fitness Pal. The lack or exercise is a tricky one as you have an injury. Is there anything you can safely do? Pilates, yoga, hand weights? Are you having physiotherapy and rehabilitation? Swimming or aqua walking? It would be worth having your medications reviewed and possible blood tests to rule out any other contributing factors. Another site to look at for answers is the diet Dr who answers these questions too. Even if the scale isn’t changing, the body is. http://www.dietdoctor.com/even-scale-isnt-changing-body . Hi, I have been on a low carb eating plan for a couple of months now and still not losing weight. Do you have any idea why? There are so many factors. How much weight do you have to lose? How many carbs are you having each day? Are you tracking where your carbs come from? Too much dairy? Too many nuts? Read my top reasons why you’re not losing weight page and see if there are any answers for you. Let me know how you get on. Libby.